Israeli illegal settlement activities in Occupied Palestine have skyrocketed in recent months, almost tripling in 2017 compared to the number in the same period last year, according to a newly published report from the Palestinian National Office for the Defense of Land and Resistance of Settlement. The report reveals the striking extent to which occupation authorities under Israeli Prime Minister Benjamin Netanyahu have escalated support to Israeli settlements — which are considered illegal under international law and even Israeli law — while allowing the expansion of illicit settlements built on privately-owned Palestinian land, which is considered unconstitutional by the occupation authority’s courts. In a clear pattern of defiance against international public opinion, Netanyahu has plowed forward with the plunder and pillaging of land belonging to the Palestinian people. 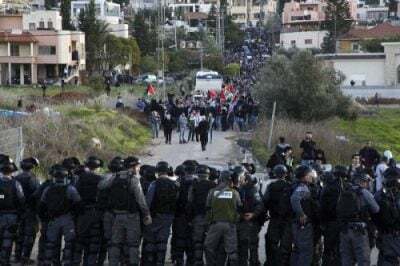 On Thursday, Netanyahu bragged of his administration’s support for the illegal activities while laying the foundation stone for a new 1,000-home district in the city-sized illegal settlement Beitar Illit south of Bethlehem, where 50,000 Zionist settlers live. The visit was the first major settlement inauguration in eight years — which settlers have credited to U.S. President Donald Trump, whose administration has provided unparalleled support for the Israeli settler-colonial project. With U.S. President Donald Trump as a friend in the White House, Israel signed off on the construction of 2,500 new illegal settlement homes in the occupied West Bank in January. This came after an earlier announcement approving the construction of another 566 illegal settler homes in East Jerusalem. The Palestinian report, connected to the Fatah Movement-aligned national office, cited the visit as proof of the Israelis’ disregard for the international community’s condemnation of settlement activity. In spite of increasing international consensus regarding the illegal nature of Israel’s settlements and the egregious human rights violations undertaken to enforce the occupation, the United States has also remained steadfast in supporting Israel. Israel receives more than US$3 billion in annual U.S. military support.